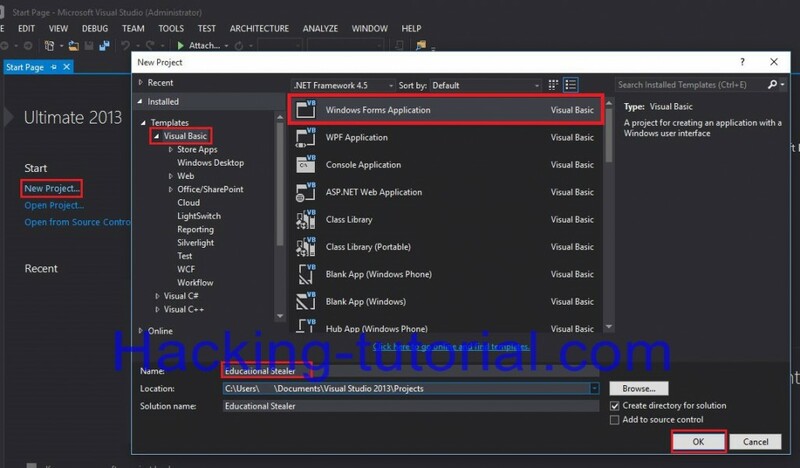 Hello, in this tutorial you will learn how to Create Password Stealer using VB Visual Studio.net that send the passwords of the victim to your email. The recovery files + code.txt (which include the code written bellow) + the visual basic project. 2) Basic knowledge in vb. We are going to create an exe file when opened it extracts 4 application which recover saved password on famous web browsers (chrome, Firefox ..Etc.) then launches them in command line mode , they will export the saved password into a text file which will be read by our app then sent to us by email. We are using vb.net because it is a very easy programming language and it is common in malicious software. 2) You will get something like this , it is called the designer here you choose how your app looks like, but for our app we want it to be silent and not visible. You will get something like this, this is where we put out code. This is called an event handler, whatever code you put between this and “End Sub” will be executed when the program first opens (before it appears). Click on resources -> add resource -> add existing file..
Notes: if you are having problems building the project turn off your anti-virus.